Have you ever heard of Mahayana? Do you know at what extent it can help you? We have gathered some interesting info on the subject, so why don’t you come and check it out? Mahayana is one of the main branches of Budhism, being the other Theravada. Mahayana is most prominent in North Asia, including Tibete, Japan, Korea and China. Mahayana is one of the major Budhism schools. Its name comes from Sanscrit and it means “the Great Vehicle”. Although there is a very thin line that separates this branch of Budhism from others, there are some ideas that characterize it very well. It encourages the upaya – this an open-minded acceptance of anything that is able to bring others to the spiritual maturity. Besides that, Mahayana Budhism is not pure philosophical as classical Budhism. This means that it even as a kind of more “religious” vein, as they worship specific deities. They usually teach there were many Buddhas, meaning there have been many enlightened ones, so the practitioners of this branch of Budhism worship Buddha, but at the same time they worship the deity, which is not a person, but instead an impersonal and wide force. The path to Bodhisattva, or the path to enlightenment, to achieve the Nirvana, is the most essential part of Mahayana. It is its most important ideal. But how is it possible to achieve it? When one is able to walk the path of Bodhisattva and to achieve all these six perfections, then he will reach Nirvana. 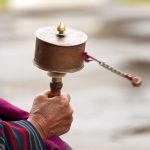 Tibetan mantras: do you know their origins and meanings?